Already great band gets even better! If you’re already familiar with Blackfield, Steven Wilson’s “other” band, co-fronted by Israeli musician Aviv Geffen, then you know what to expect here: Pink Floyd-inspired pop rock with some melancholy meanderings, some light progressive rock diversions, some uplifting catchy rock tunes, and Seventies-inspired songwriting that combine to form a unique package that will appeal to both musicians and music fans. The band features Steven and Aviv sharing guitar and vocal duties, as well as some keyboards, and they’re backed by the same great lineup as before: Seffy Efrat on bass and Tomer Z on drums. Other standout tracks include the other Floyd-esque track, “On the Plane,” the up-tempo “Waving,” which borrows some serious mojo from Porcupine Tree’s Lightbulb Sun period, and the Trevor Horn-produced track, “Oxygen.” Reflective ballads like “Far Away” offer classic Wilson material. No point in belaboring the obvious: if you like serious musicianship, great songwriting, great production, and have an ear for great pop and rock music, you’ll need to put this CD on your short list. This is inspiring stuff. Here at MusicPlayers.com, we get releases from a ton of up and coming female artists that want us to review their material. The female singer/songwriter format is so grossly overdone that it turns us off due to boredom — it all starts sounding very similar and unoriginal. But when Editor-in-Chief, Scott Kahn and I sat down for a listening session and came across Malea McGuinness, we immediately knew that she was going to get a review. The opener for the album, “Spinning,” is a great track. It immediately had my attention. One of the important things about this album that sets it apart from other female artists is that it has a great “band” feel to it, with all the musicians more than able to stand on their own. This rock “edge” within the songs certainly endears the music to a wide spectrum of listeners. It also makes me really happy to hear that there is someone utilizing a lot of gritty electric guitar in the context of pop music. Maybe it’s a revival, dare I say. But on top of all the other great features Close as Air offers, the distorted guitars give the album an alternative twist. The production for the album was fantastic and gave it a lot of character. Like the many styles of music that can be heard — rock, pop, and country, the production offers ethereal types of sound while at the same time maintaining a primarily mainstream framework. Every instrument featured on the album (quite a few for that matter) are crystal clear while still maintaining a distant sound. The only thing I didn’t totally enjoy was the actual songwriting, i.e. lyrics and subject matter. After a while it began to take on a repetitive quality, a failing of the singer/songwriter genre. While this isn’t the be all and end all of female rock albums, it is definitely something worth checking out. There is a genuine charm that’s evident as soon as you begin listening. There’s a lot of room to evolve from this album and I can foresee the next effort to be even better. We look forward to hearing more from Malea in the future. Engaging retro-pop that crosses international boundaries. Who knew that New Wave had such a following in South America? Despite not knowing what the f*** these guys are singing about (they’re from Columbia and sing in Spanish), I was intrigued from the first song they sent us for consideration, and the rest of the CD kept me listening over and over again. The ‘80s New Wave influences are all over this electronic pop/rock record: Ultravox, Gary Numan, Icehouse, Depeche Mode, Devo, Erasure. Big keyboards, baritone guitar lines, electronic drum machines, cool vocal harmonies. It’s all here, which is a real surprise coming to us from South America! The band opened shows in Latin America for Coldplay, so you know there’s some real respect for this group’s talent. It’s only a matter of time before Fernando Sierra (or Elvis if you prefer his stage name) starts singing in English. If he does that on the next album, expect it to go viral in the USA. A classic concert event that belongs in any Yes fan’s collection. Yes fans rejoice! If you’re like me, then you’ve been waiting twenty years for the release of this classic concert performance. Filmed in 1991 at Mountain View, California’s Shoreline Amphitheater and only now release to a worldwide market (Laserdisc owners in Japan saw this release years ago), this fantastic multi-DVD and CD set captures the band’s most ambitious tour ever. During the 90125 and Big Generator era, Jon Anderson was splitting his time between the Yes lineup of Trevor Rabin (guitar), Chris Howe (bass), Alan White (drums), and Tony Kaye (keys), and the “classic” lineup going by the name Anderson, Bruford, Wakeman, Howe to designate its band members. 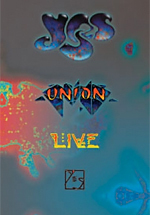 As the two groups were developing new records, they ultimately came together to release an album, Union, that featured a collection of songs written and performed by each faction. A major tour followed, which included all of the members of both bands. The mix is surprisingly good for having so much going on at once, with Bruford playing electronic drums alongside White’s acoustic kit, two monster keyboard players, and the obvious dichotomy of Steve Howe and Trevor Rabin. If you’re a fan of the period, then the music presented here won’t disappoint, and it’s great to see those ridiculous clothes again. But sometimes, we found the incessant electronic drumming took away from the rock element of White’s solid pounding. This was a difficult period for the band, and diehard Yes fans can see and feel the tension within the group. Not all members were excited about the whole “Union” concept and tour, and the show appears to have been taken its toll on Howe, who seems relatively unhappy about sharing the stage with Rabin, who shreds circles around him. But Howe gets his time in the spotlight, as the concert features extended solo excursions from all band members. A bonus DVD includes two additional concerts captured as bootlegs. The video quality here is horrendous, but the sound is surprisingly decent enough to keep fans like us watching, and these shows contained almost twice as many songs as the professionally filmed main event. But wait! There’s more! The deluxe packaging includes a two-CD set of the audio from the concert, a reproduction of the concert tour book (with a great biography up until this chapter in their career), and some goodies like a laminated tour access pass and crew sticker. There’s hours of classic Yes music to be culled through here after you finish the main concert event, and a few bonus surround audio mixes of songs like “Lift Me Up” which regrettably is omitted from the professionally filmed concert, though it appears on the bootlegs. Overall, if you love both Yes camps, this is essential viewing that belongs in your collection. Essential reading for gigging bands looking to improve their live sound. 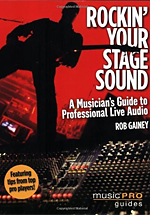 Professional musician and live sound engineer Rob Gainey has put together an outstanding book on the subject of getting a great live sound at your shows. Have you ever been in a band where you didn’t have good monitoring at live shows? Ever play with a musician or two who insist on playing too loudly for you to hear yourself? Have your vocals fallen flat in the club thanks to vocalists who can’t nail their pitches because they can’t hear each other? Rob’s book can help you to overcome all of these challenges, and it’s a book that everyone in your band should take the time to read as it’s filled with useful information for all of the musicians in your group. Rockin’ Your Stage Sound begins with optimizing the sound of your instruments and amps before you even get to the stage: everything from eliminating stray squeaks in a drum kit to checking cables to proper mic handling technique. When it comes to setting up on stage, Rob goes into great depth covering different approaches to staging your live sound, and we’ve pulled an excerpt from this section of the book for our feature story this month — read it here. Does your band have stage plots and cue sheets? If not, Rob will help you get these essentials nailed. And for those of you who need help in the monitoring department, this section of the book is worth the price of admission. Rob covers multiple types of monitoring environments (types I through IV, plus hybrid setups). It’s not as simple as you may think! The inclusion of information regarding playing audio loops and flies is also a great inclusion. Throughout the book, comments and tips are provided from multiple professional musicians that provide additional perspectives and insight into getting a great live sound. Working with stage managers and sound engineers is also covered thoroughly. If you want to avoid the common pitfalls that make a band go away thinking “the sound guy ruined my set” and likewise have the sound guy not enjoy working with you, this book makes great reading. At times it’s a little bit technical, but if you really want to rock your stage sound, make a point to get at least one copy for your band and take the time for everyone to read it. There’s useful stuff in here for everyone. To read some of this fantastic book, click here.